Let’s brine and roast a turkey before the holiday is over. I have decided that I definitely LOVE brined turkeys. I have heard people say that they can’t tell the difference. I can! I have noticed that the flavor of the brine goes through the meat to the bone. The texture is a bit difference and when you squeeze on the meat the juices are visible. It’s easy, but requires you to be on your toes because you need to start brining two days before you roast the bird. Thanksgiving is on Thursday so you have to remember to brine the turkey on Tuesday. 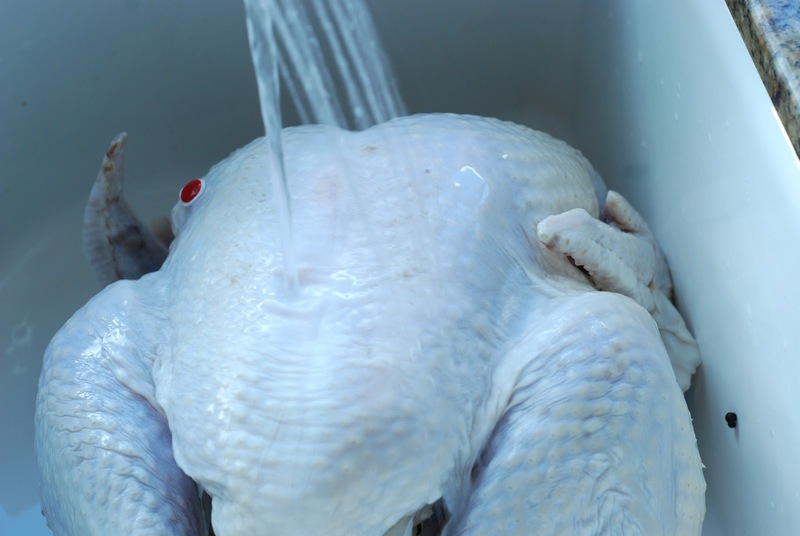 Wednesday, you will need to drain the turkey from the brine, rinse and let drain on paper towels for 24 hours. Thursday – roast. Simple quick steps, but you have to be on top of your game. 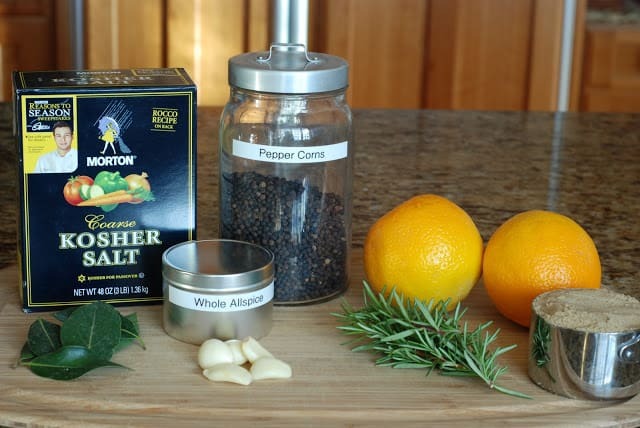 For this brine you will need: Kosher salt, peppercorns, whole allspice berries, bay leaves, rosemary, orange zest, garlic and brown sugar. 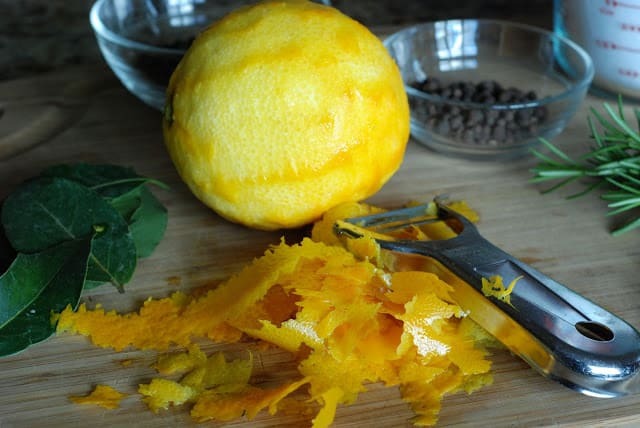 Let’s start preparing the orange zest. I just use a potato peeler and “saw” my way down the outsides of a firm orange. Zest two oranges and save the oranges for another use or just eat them. Set the zest aside for a moment. …and last of all, add the bay leaves. Bring the water to a simmer and stir. Heat just until the salt and brown sugar have dissolved. Remove from the heat and let the brine cool COMPLETELY. 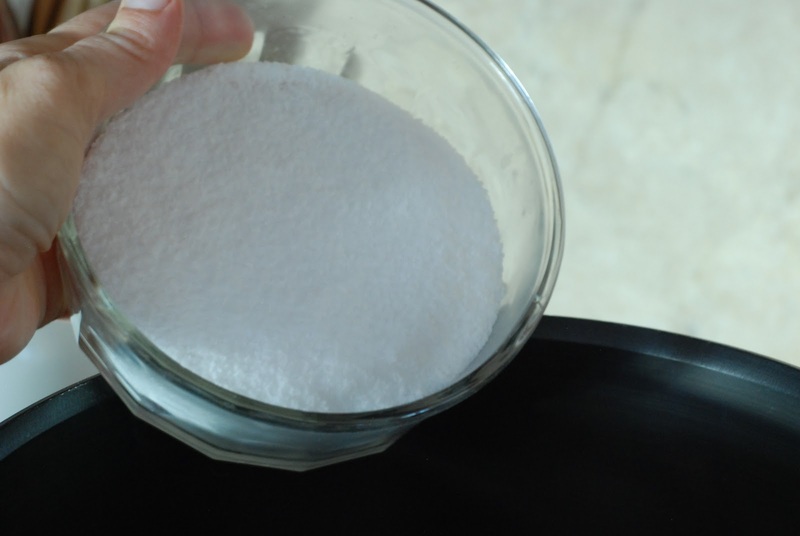 If you pour hot brine over your turkey, you will start the cooking process. This is a brining bag. It’s a HUGE double zip lock bag. 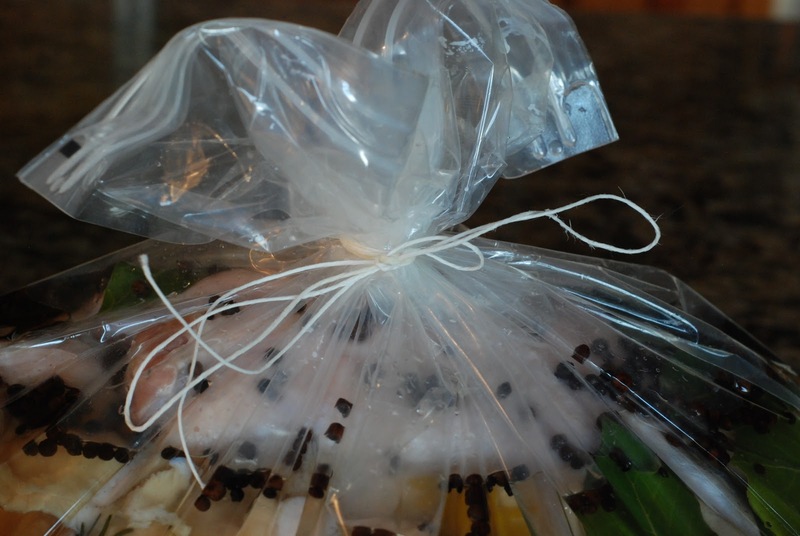 You can purchase brining bags at Williams-Sonoma or Sur la table. They are awesome. 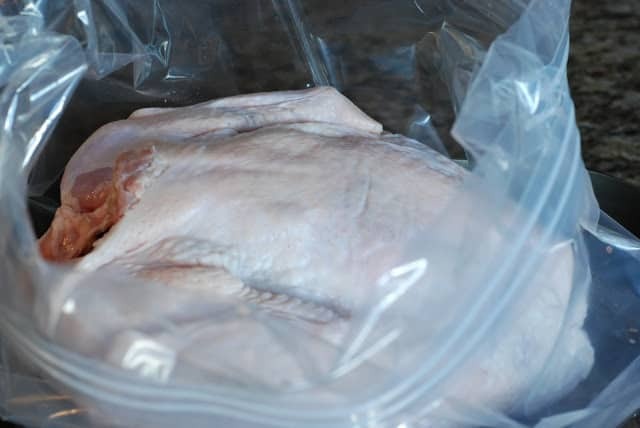 Pull out the HUGE brining bag. I like to set my bag in a smaller roasting pan so that it holds the bag in place. Let’s talk turkey. When brining a turkey, I think it’s best to use a fresh turkey. Look for a turkey that hasn’t been pumped full of sodium or other fluids. 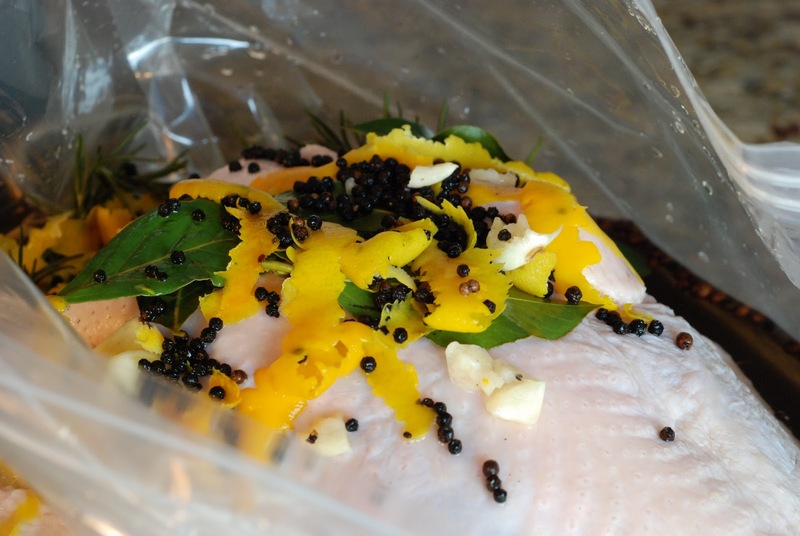 This brine is salty so you don’t want to brine a pre-salt injected bird! Understand? Plop that bird, breast side down, in the bag. Make sure you have removed the neck and giblets. Save the neck and do whatever it is you do with the giblets. Carefully pour or even better ladle the brine over the turkey in the brining bag. Now read this very carefully. Watch the sides of the bag. In fact find a helper to hold the bag. If you don’t, the sides will collapse and the brine will spill out all over the counter then run onto the clean kitchen floor. I speak out of experience! As I was pouring my beautifully cooled brine into the bag, the bag tipped over and within an instant my brine was all over my kitchen. Once the “spilling process” starts there is no stopping it. All kinds of colorful expletives came spewing from my mouth! This is something I do. 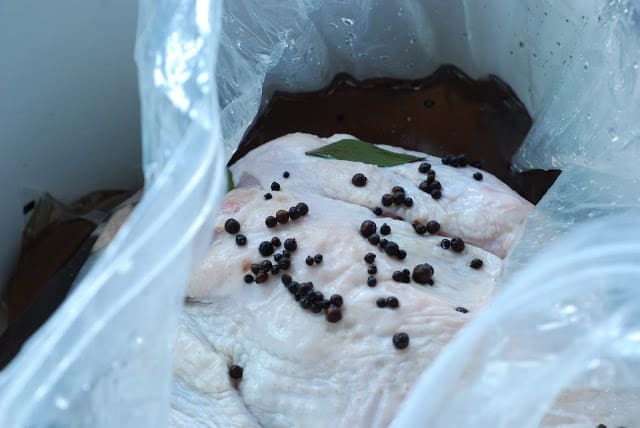 I don’t like to turn the bird over mid-brine. 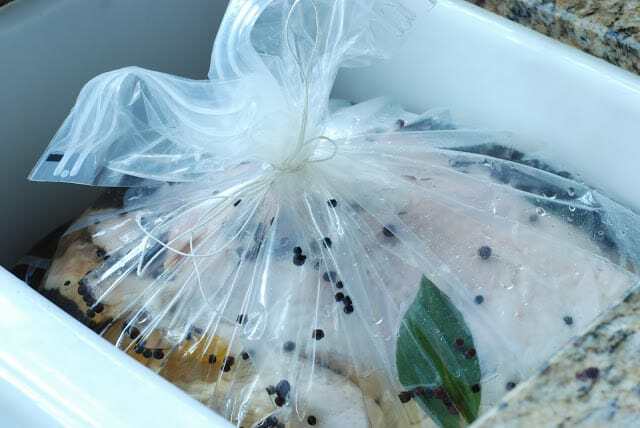 I take some kitchen twine and gather up the zip lock edge and tie it up so that the brine pretty much completely covers the bird. Can you see this is the picture? I already had the bag sitting in a smaller roasting pan that is a beautiful copper pan that desperately needs to be polished. Just slide the pan and the bird into your refrigerator and let set for 24 hours. 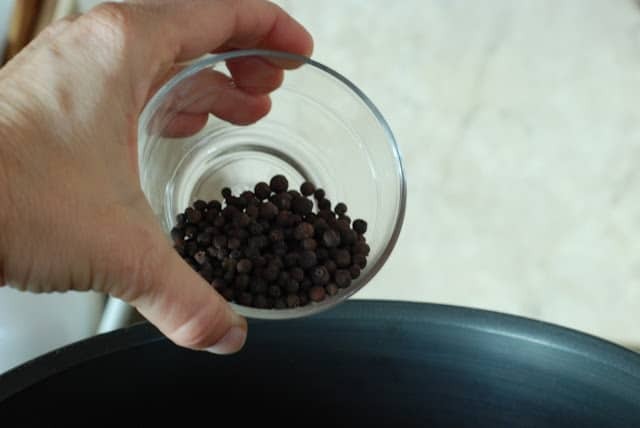 After the 24 hours have passed, take the bag out of the roasting pan and set it in your kitchen sink. This will help alleviate any of the brine spilling out EVERYWHERE. Take a pair of scissors and cut the string. Open the bag and gently drain of all of the brine, which will flow gently down the drain. I catch the solids of the brine in the wire stopper for the sink that I loosely set in place. Discard the solids. Rinse the bird with cold water. Rinse until all of the lovely particles have been rinsed off of the bird. Wash out the roasting pan and place several layers of paper towels in the bottom. Placed the bird on the paper towels. Cover the bird well with plastic wrap or aluminum foil. Put the turkey back into the refrigerator for another 24 hours. Why this step? The brine is salty that can result in extremely salty juices and a salty gravy. The draining period helps with the saltiness. Tomorrow you can roast your bird. It’s going to be the best flavored bird you have made for Thanksgiving. **note to reader: Food is subjective and this is only the opinion of the author…ME. In a very large stockpot, heat water. 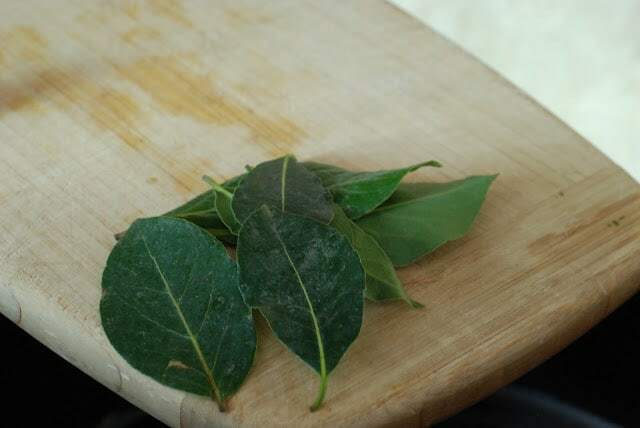 Add salt, bay leaves, orange zest, peppercorns, allspice, brown sugar and garlic. 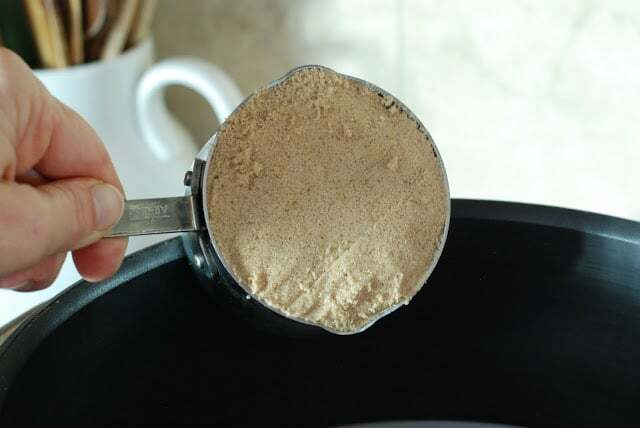 Heat and stir until salt and brown sugar have dissolved. Cool completely. 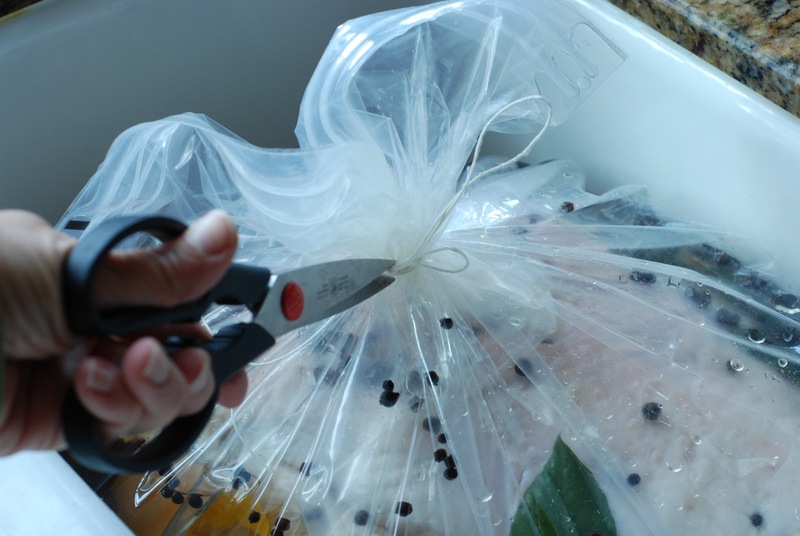 Place a turkey that has the neck and giblets removed into a large brining bag and pour cool brine over the turkey. 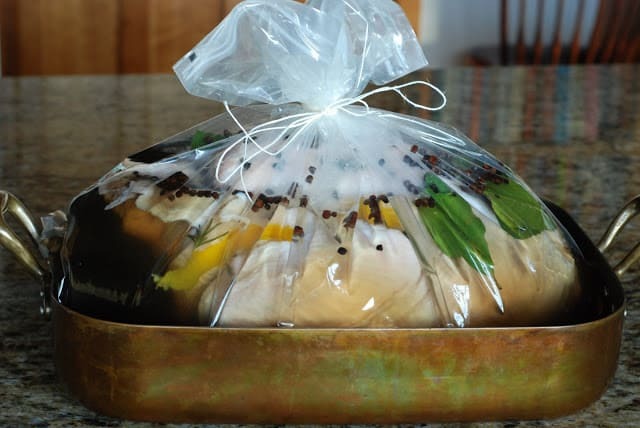 Refrigerate for 24 hours then drain the brine from the turkey. 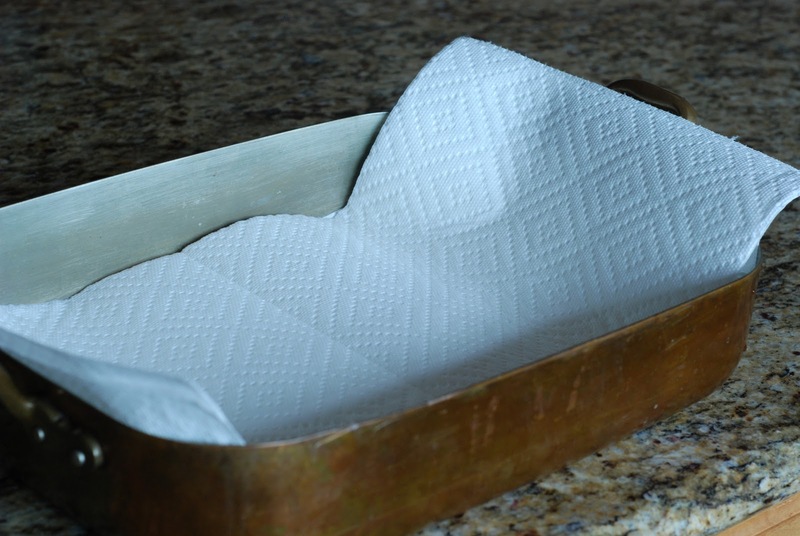 Place several layers of paper towels in a roasting pan. 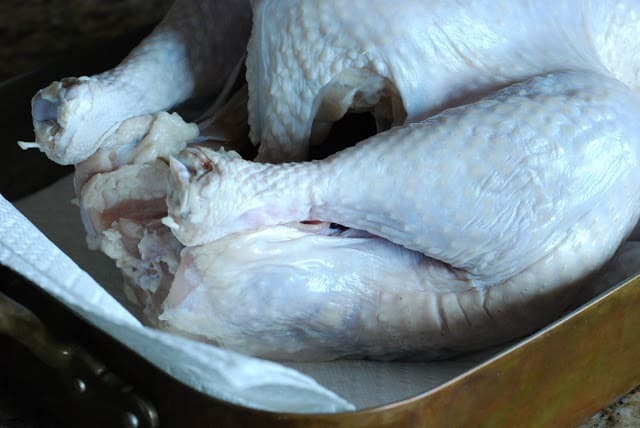 Place brined turkey on the paper towels, cover with plastic wrap and refrigerate for at least 24 hours before roasting. Makes enough brine for a 20 lb bird. Should I still brine if I'm 24 hours out from Tgiving? Yikes. I have a fresh turkey. 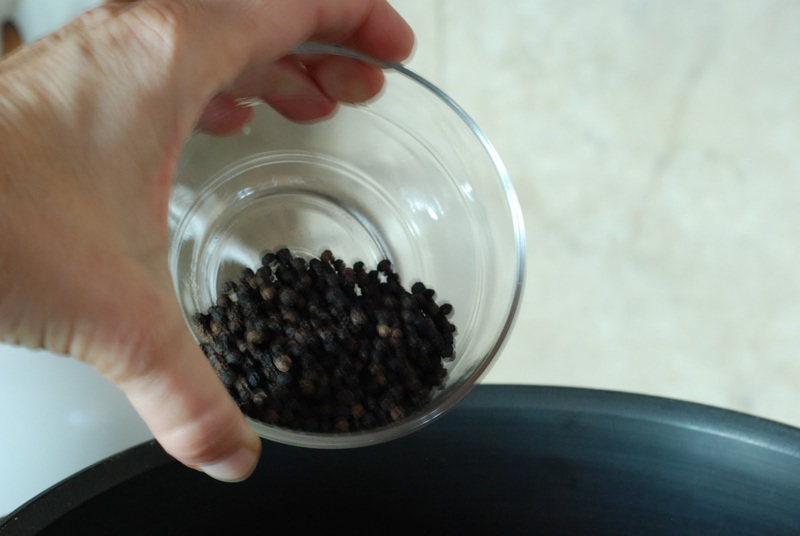 Also, where are Allspice berries in the grocery store??? THanks!! Hi Michelle, Try this http://simplysogood.blogspot.com/2010/11/roast-turkey-with-apple-cider-gravy.html It's a family favorite. I hope this works for you. Brining is THE way to go with a turkey. Good luck. How much does your turkey weigh and where did you get the bag? 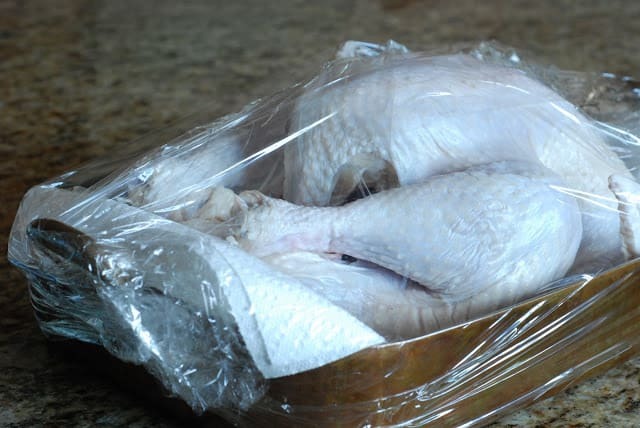 The bags that I've found only allow the turkey to be vertical and I think this way would be better. I pretty sure this was a 16-18 lb. Turkey. I purchased my bags from Williams-Sonoma. I have brined before and love it! If your turkey isn't too big, you may be able to put it in the veggie drawer in your fridge instead of the roasting pan. It worked like a charm for me. Fabulous idea. Thanks for sharing. 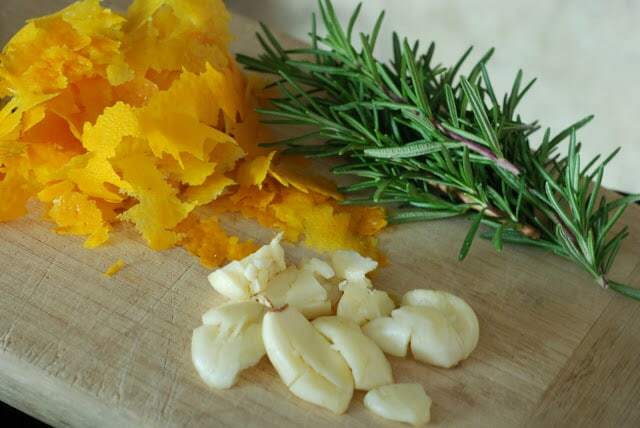 I added the rosemary to the recipe. Thanks Boo for bringing that to my attention. Thanks 🙂 I've made it twice now and it's turned out amazing both times! The gravy is amazing. My husband won't eat the old gravy anymore! He saves it for days. I wish turkeys and cranberries weren't so seasonal. It was really hard to find a turkey in May! Anyways, hope you are doing well. Miss you. It would be nice to see you next time I'm in town. Might be a while 🙂 I'll email you some pictures of my growing family. They are SO cute and SO fun right now. I would absolutely LOVE to see you and your family. You are such a domestic diva! So talented. If you are ever the in old neighborhood, PLEASE stop by. Tiff's getting married in Aug. Can you believe that? Janet! This blog is amazing! I can't wait to try some of these recipies! What a lot of work…but so helpful for everyone who wants a step by step! Hope your Thanksgiving was a success! Great talking with you! Oh Michelle. I feel your pain! That just has to be the biggest mess ever to clean up – don't you think? I'm sure your turkey was fabulous! I just found your blog after googling, "My brine just spilled all over!" Yes, floor, drawers, counters, me. If only I had found you earlier. But, I take great heart in knowing that I am not the only one. I will be unable to let it sit for too many hours after rinsing, but I am still of good cheer, am hoping for an edible turkey and am heartened to read your blog! Happy Thanksgiving. Hi Sheri, I'm sure you turkey will be a great success. Yes, Steve, you do have to be on top of your game. 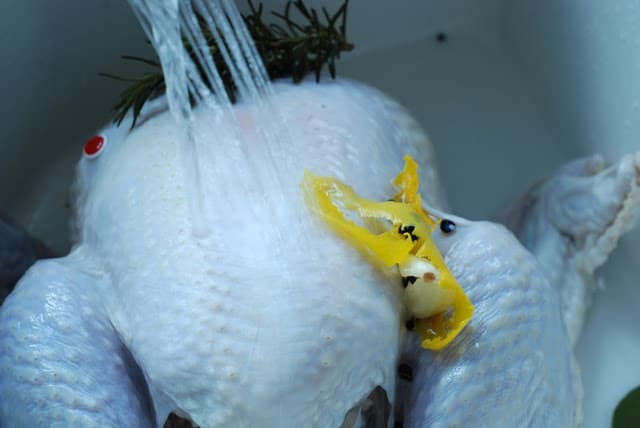 You've got to think at least 3 days in advance and that bird need to be thawed! Have a great Thanksgiving. ". . . but you have to be on top of your game" LOL, that one almost got by me. This is my first Thanksgiving dinner that I will be making for my own little family, away from my parents. I've never made a turkey before, but I'm really excited to try out your recipe.